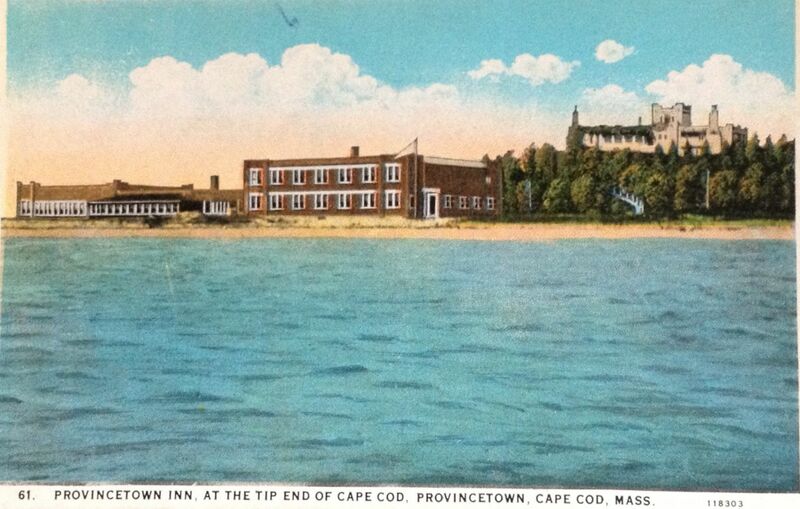 Looking out across Cape Cod Bay, the Provincetown Inn was built back in 1925 and initially had 28 guest rooms. Shown in this vintage postcard, it is located at the very end of town near the Breakwater and today looks quite different than it did at the start of the 20th century. Purchased by Chester Peck in 1935, in the 1950s a beach was “created” using sand from the nearby dune and four additional acres (according to the Inn’s website) were created. Hmm that is not something that would be allowed today, with concerns about retaining existing coastline and drainage, but the result was a spacious resort with night club, three dining rooms, gift shop, barber and beauty shops and more. Thirty-two more rooms were also added. In 1972 the inn was sold to investors and in 1977 was sold to the Evans family. During the mid 1970s Marvin Hagler started coming to Provinetown to train at the Provincetown Inn and jogged across the sand dunes to get into shape. He set up his very own ring by the indoor swimming pool. Hagler was world middleweight boxing champion from 1980-1987. While the indoor swimming pool is no more as the Inn has continued to be refurbished through the years one thing that does remain are the hand-painted murals that were painted by Don Aikens that were inspired by old photographs, postcards, and paintings showing how the town looked in the late 19th century. It’s a favorite spot for the Carreiro family children to visit (the Carreiro’s being a fictitious family in the novel Remaining in Provincetown). They’ve got a lot on their minds with their father being murdered. Will they catch who did it? Stay tuned for more information and more vintage pictures.